Sony’s 4th Generation Aibo robot dog. 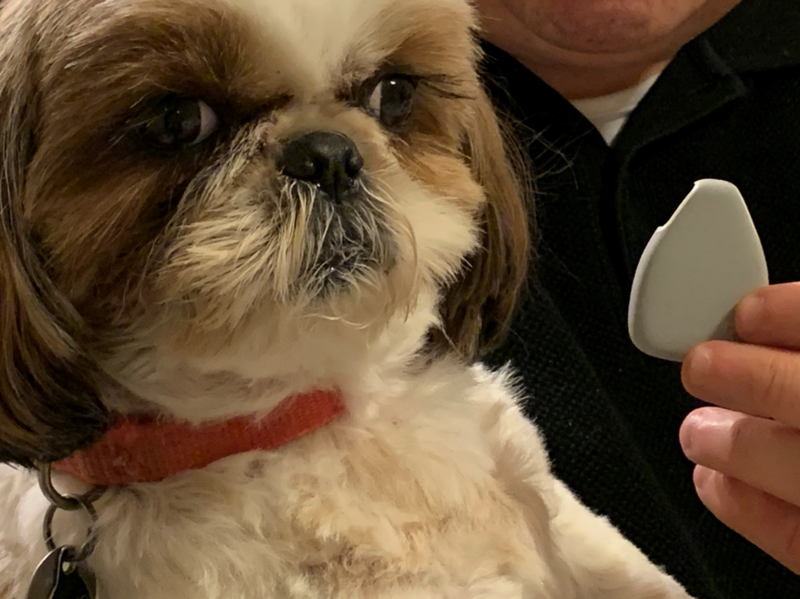 If you love dogs or cats, you’ll enjoy this week’s column in my ongoing search for the coolest smart home technology products on the market. 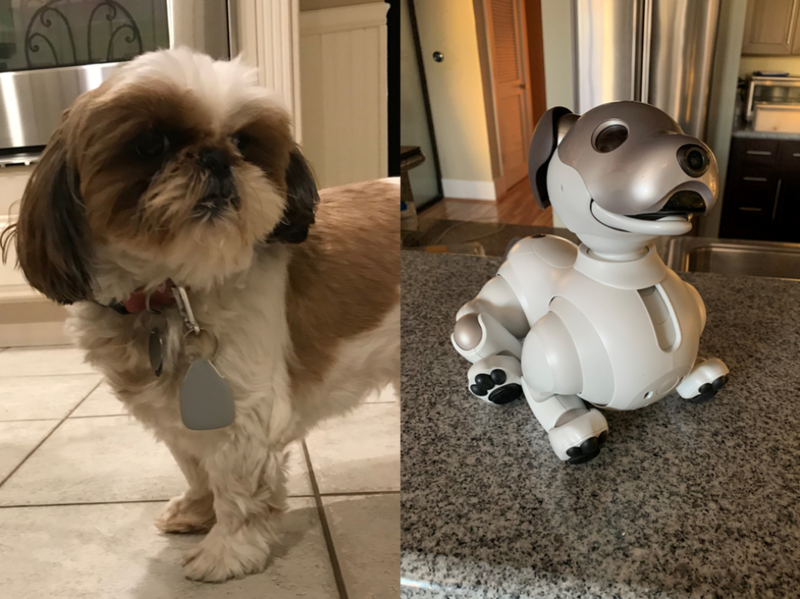 Today I’ll take a look at two new products: Sony’s newest robotic dog, and a location tracking solution for kids and pets. For decades, movies like the Terminator film series have mostly portrayed robots in a terrifying and frightening manner. Thanks to Hollywood, we’ve been brainwashed to believe robots are up to no good and are out to destroy mankind as we know it. Sony’s new Aibo robot dog refresh, ten years after it first appeared on the scene in 1999, is an unapologetic rebuke to this imagery. You won’t see this Aibo appearing in any Terminator sequels any time soon. The fourth-generation Sony Aibois unquestionably more intelligent, curious, and adorable than its original version. While I concede that Aibo can only be truly appreciated if the owner is willing to suspend their critical faculties and believe that it is a real dog, it’s extraordinary how much enjoyment Aibo can generate. Aibo’s technology pedigree is first class and it showcases Sony’s spectacular engineering prowess. It features a 64-bit Quad-Core processor, two cameras (one on the nose and one on the base of its movable tail), 22 motorized joints, and four integrated microphones that allow it to explore, see, and respond to its milieu. Aibo has round OLED eyes (a bit eerie for my taste) that facilitate a multitude of exceedingly cute expressions. Also, if Sony is to be believed, Aibo can remember up to 100 people. Frankly, that’s a better memory than some of my friends have. Being that its 2019, Aibo was upgraded to communicate with the outside world via an 801.11 wireless connection and a 4G LTE cellular radio. Out of the box, Aibo is preconfigured as a puppy that becomes distinctly more mature over time. The dog’s AI personality develops in real-time via the product’s cloud service (which also allows the owner to download new skills and idiosyncrasies). Battery life is a reasonable 2 hours, though it takes 3 hours to fully charge via Aibo’s charging pad (which is about the area size of a large shoebox). Aibo automatically returns to its charging pad when its power is running low. During my two-week trial period with the product, I was amazed by how it would repeatably (and reliably) return to its charging stand, navigating through a decently crowded living room area with numerous obstacles in its path. Via its smartphone app, Aibo can also take pictures and broadcast video (though that consumes significant battery power). With its plethora of sensors, Aibo provides emotional responses to a pat on the head or on its body. It’s also undeniably cool to see how Aibo responds to voice commands like “shake hands” and “sit down” (or even “dance”). If it wasn’t for its slow and staccato-like style of walking (especially when it’s negotiating a corner turn), you’d swear Aibo is a real dog. I’ve uploaded a short video of my interaction with Aibo that showcases this. Aibo’s steep $2,900 MSRP begs a simple question: can it really replace a real dog? After two solid weeks playing with it, I suspect many people might say “yes” as it doesn’t have to be fed and it doesn’t require walking. After the novelty of playing with it for the first few days wore off, Aibo would independently get up from its charger station early in the morning, stretch, and walk around my home, just like a real dog. And just a like a real dog, it would get a bit ornery if I didn’t play with it. With all of this in mind, and noting that continued advancements in AI will have a huge impact on products like this, I’m convinced that Aibo and other (presumably more life-like) iterations hold enormous potential to provide emotional support for the elderly who don’t have the ability to care for an actual dog. On top of that, there are the future mobile security and surveillance applications that a robotic pet might provide. Sony deserves kudos for how far it has taken the concept of a robotic pet; it’s mind-blowing to think about what the 6th or 7th generation models will be capable of over the next 5 years or so. After spending two weeks with Aibo, I wish I didn’t have to send it back to Sony. 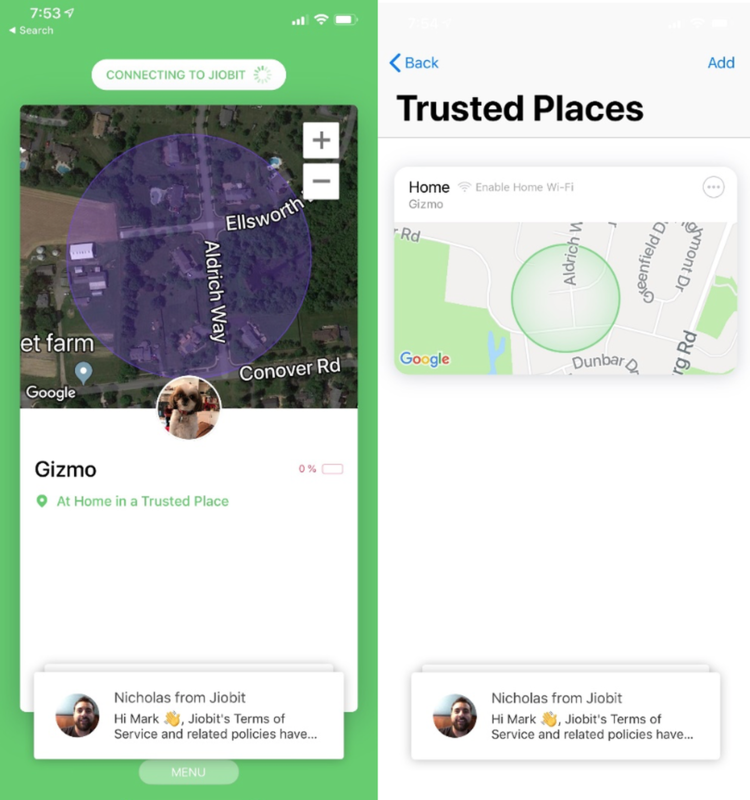 The Jiobit location tracker solution. Jiobit is one of the smallest location tracker solutions on the market. For all of its capabilities, it would be nice to see future versions of Jiobit equipped with a small “panic” button so that children could press and alert others for help. It would also be helpful for future versions of the app to include weekly or even monthly history information (the current app simply provides daily history data). Finally, the $99 MSRP requires you to commit to a $10 per month contract for cellular access (Jiobit uses a hybrid cellular network so it works virtually anywhere). If you prefer to pay the higher $149 MSRP, the monthly cell service contract comes down a bit to $8 per month. Users can add additional trackers to their base plan for $4 month. As we will soon be in the midst of March Madness and the beginning of the Major League baseball season, my next column will focus on the ultimate cord cutting solution: a spectacular 75” TV, one of the best devices to access your local TV channels in glorious HD for free, and a relatively new device that allows you to manage all of your video device products in an effortless, integrated way. Stay tuned—I think many of you will be jazzed with this setup.